Are you planning the next trips of your choir and looking for interesting festivals and competitions? Do you like the “Cantat” idea and would love to join another Cantat festival in the coming years? Do you need orientation in the “jungle” of choral festivals and competitions? Are you looking for a big international event for conductors? Conductors and managers as well as representatives of choral organizations will receive useful information in this session presenting the next Europa Cantat, America Cantat and Africa Cantat Festivals, the Choralies, Zimriya and Nordklang, the World Symposium 2020, the member festivals of the Choral Festival Network and many more events and useful websites in Europe and beyond. 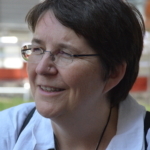 Sonja Greiner is the Secretary General of the European Choral Association – Europa Cantat and a member of the Board of the World Youth Choir Foundation. After being the manager of the International Chamber-Choir Competition and the festival Musica Sacra International in Marktoberdorf (Germany), she started working for Europa Cantat (European Choral Association – Europa Cantat since 2011) in 1995. She was a member and Treasurer of both the European and the International Music Council and was elected Honorary Member of the International Music Council in 2015.